Made in China: a future world cup winner? On 4 June 2002, the national football team of the People’s Republic of China took to the field for its first ever match in the FIFA World Cup. For the few thousand Chinese fans in the stadium, and the 500 million or so watching at home, the fact the team had made it there at all was considered the greatest accomplishment in China’s football history. ‘The Great Wall’ would go one step further if they were able to score a goal during the tournament. They didn’t. Playing against Costa Rica, Brazil (the eventual tournament winners) and Turkey, China finished bottom of their group and conceded nine goals. They haven’t been back to a World Cup since. Failing to qualify in 2006, 2010 and 2014, the team could still make it to Russia in 2018 - but even if they don’t, there’s still plenty of time for China to realize its ambition of winning a World Cup by 2050. If they were to achieve that lofty goal - some cynical followers of the England national team might even bet on China lifting the trophy before the Three Lions do so again - they would very likely be thanking their current President, Xi Jinping. A professed football lover, President Xi wants the country to become a global leader in world football, and has pledged the money to make it happen. This includes setting up soccer academies, hiring coaches from abroad, and even offering citizenship to foreign players. But Chinese football fans might also be thanking globalization. Globalization, the process by which markets, people, goods and culture become more integrated, is already exemplified in European football. The Dubai-based airline Emirates sponsors some of history’s most decorated teams, including in England, Spain and France. More than 20% of Premier League teams are run by American owners, and over half the clubs in England’s top two divisions are owned by foreign investors. 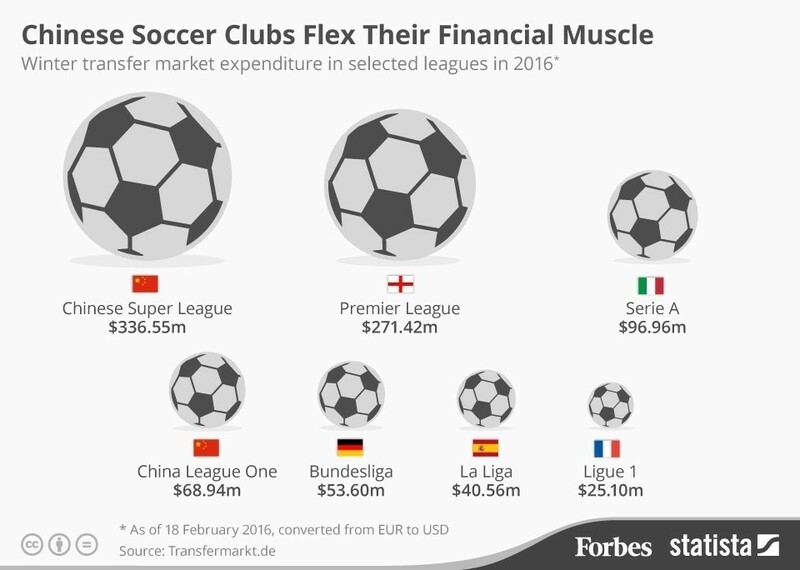 China is now getting in on the act, with Chinese companies spending billions of dollars acquiring clubs across Europe, as well as investing in football in their own country. So what can we learn from China’s interest in the beautiful game? And what does all this tell us about globalization and the state of the world today? Since World War II, the world order has been largely shaped by liberal, Western influences. This power structure emerged in the aftermath of the 1939-45 conflict and produced institutions like the World Bank, European Union, the North Atlantic Treaty Organization and the International Monetary Fund. After the fall of the Soviet Union, it appeared that the ideals promoted by the Western powers had won out. In football as in politics, there are centres of power. Traditionally, these have been found in Latin America and Europe: of the 20 World Cups to date, nine have been won by Latin American countries and 11 by European nations. And just three countries - Brazil, Italy and Germany - have won 65% of the titles. In general, Latin America has tended to produce the most skilful individual players, while Europe has taken credit for developing styles and philosophies within the game. A core of European countries was able to do so quite synchronously because of their common borders and networked economies: as in any globalized economy, innovation was able to spread quickly, and these countries became the most influential power bases for world football. It’s no surprise that power in football and power in politics are intertwined. Over time, governments have come to realize that sport is a fantastic instrument of soft power. Research shows that sporting events can be used to spread a nation’s cultural values, as well as making a country more enticing to foreign investors and students. In a globalized world where everyone is competing for limited resources, the ability to attract talent and investment becomes critical. But as the traditional wielders of power face challenges, space is opening up for other countries to fill leadership gaps. Enter, China. With nationalism on the rise, many Western nations are turning inward, pursuing national interests at the expense of international roles. Xi cautioned against this in Davos in 2017, calling for more trade and cooperation. But just this month, US President Donald Trump announced that he would pull out his country from the Paris Climate Accord - with China set to take on a bigger governance role as a result. Readers should see China’s foray into football in the same terms as its growing presence on the diplomatic stage - as an extension of its existing policy. The speed of investment is striking, but we should expect it to continue as China’s economy diversifies and its international role grows. In Soccernomics, sports journalist Simon Kuper shows how the Spanish national football team’s success grew in step with the country’s integration into economic markets. Its footballing trajectory went markedly upwards as its economy globalized, culminating with three back-to-back wins in international tournaments - the 2010 World Cup was sandwiched between European championship glory in 2008 and 2012. Interestingly, Kuper also attributes improvements in US soccer to globalization: “Soccer’s advance in the US is an index of how daily life is globalising there. The two groups who are keenest on the game – immigrants and the coastal elites – are precisely the most globalised Americans … The estimated number of Hispanics living in the country today is 43 million – up threefold since 1980, and most of them from football-loving Mexico – and approximately equals Spain’s population. The US has more young soccer players than any other country. No wonder the national team is improving fast”. In the same way, economic globalization has brought improvements in living standards around the world. According to the World Bank, trade has helped halve the number of people living in extreme poverty since 1990. Specific to China, The Economist has detailed how China has gained hugely from globalization, with hundreds of millions being lifted from poverty, accounting for 19% of the growth in global prosperity over the last 10 years. The country is now actively shaping activities to globalize further, such as the Belt and Road Initiative. In recent months, Chinese clubs have brought in foreign players to augment their squads, and pumped millions into European clubs with the aim of picking up some of their coaching and marketing knowledge. In other words, China is riding the wave of globalization to advance its economy and create jobs. It is anticipating that globalizing its football market will be just as beneficial. After the shock elections of 2016, globalization came under intense scrutiny. While the world was undoubtedly better off overall, some communities did not experience the same gains in income and living standards as others. Indeed, a certain profile seems to have lost out entirely: research shows that low-skilled workers in the US became worse off as manufacturing activity moved to China. As Diane Coyle explains, the dual forces of automation and globalization created imbalances in the speed at which globalization has benefitted people’s lives. Branko Milanovic’s famous ‘elephant graph’ was able to pinpoint the precise percentiles in the global income distribution that were the biggest non-winners from our increasingly globalized economies. Policies were not in place to protect the losers of globalization - a political realization that arrived all too late for meaningful response. The electoral backlash was notably heightened amongst voters who identified with certain values. Immigration played a role in the Brexit campaign, and some politicians were able to skilfully target their messages to voters that felt foreign workers were to blame for unemployment. In the US, non-economic issues have increased in importance as identity groups harden in response to losses. Football fans have lived through a microcosm of these issues. Balancing priorities between club and national teams is an ongoing debate. In Europe, immigration has led to the composition of national teams becoming more ethnically diverse - a fact many in Switzerland were quick to highlight after the country voted to limit immigration. 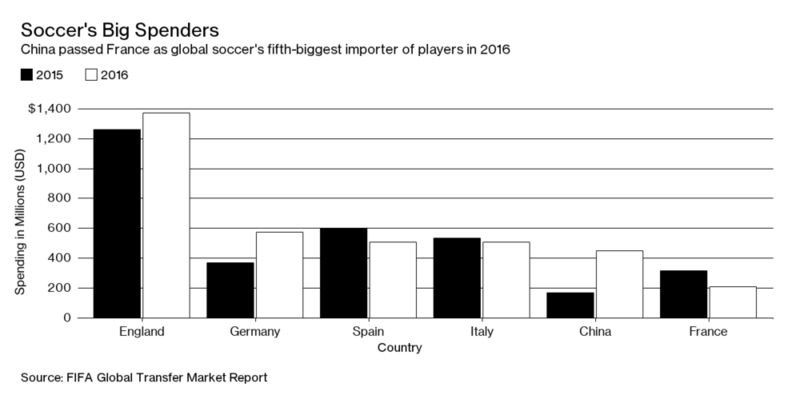 While the influx of foreign players has increased the quality of European leagues, it may be at the expense of the national good. One analysis showed that, at the last European championships, just 37% of players played in their domestic leagues - and 25% of players were contracted to English clubs. The worries that local sporting culture is being eroded are compounded by the commercialization of football more broadly. The gains have been mostly felt by a handful of clubs - in the UK, only five teams have won the league in the past 20 seasons (one of those being the outlier Leicester City), and the majority of television revenues accrue to the top division. At the same time, more than 50 clubs have become insolvent. 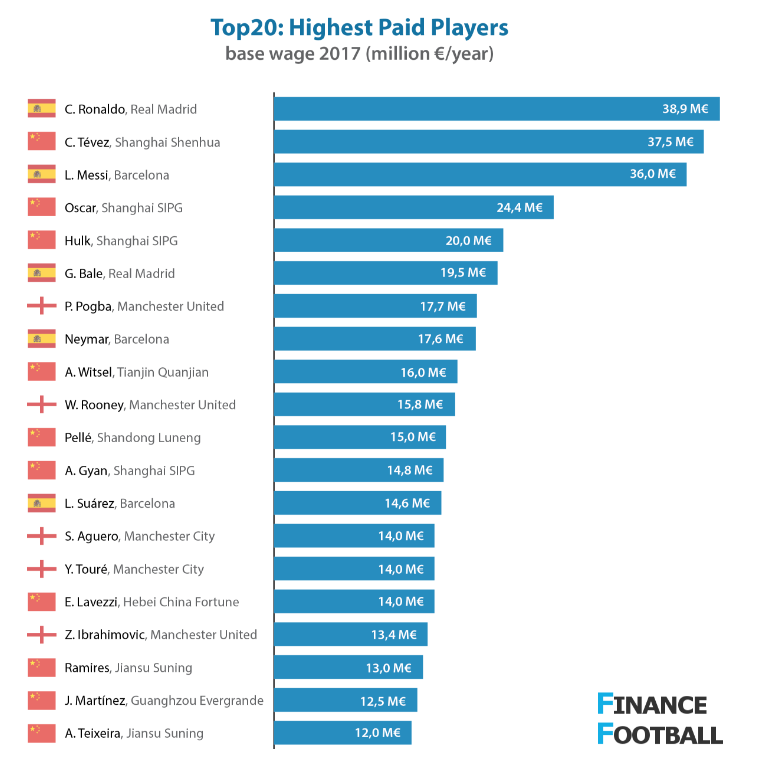 China will be watching such developments closely, and clearly has an eye on protecting its league from hyper-inflated salaries and transfers. Already, the Chinese football association has introduced rules that limit the number of foreign players on the pitch, as well as announcing a 100% tax on transfer fees for foreign players at loss-making clubs. Seeing whether the government acts as cautiously in the international economy will be interesting. But as the global centres of power move east, and China continues to globalize, its footballing success may no longer be in the hands of the gods.